Before Investing in Reusable Grocery Bags, Make Sure They Include These Features! There are certain qualities or features of top brands and products that put them above the competition. This is magnified in the case of custom reusable grocery bags because of the value they have for both the user and the brand. With this in mind, we‘ve broken down three features that a top-notch reusable grocery bag should have. Each one is crucial for making them more appealing and effective in the long run from a customer and brand perspective. Are there multiple choices for colors? Can I print my logo onto the bag? Is there a variety of sizes and styles to choose from? If any of these questions are answered with a resounding “no,” the bags likely aren’t right for you or your brand. Without proper customization options, a reusable grocery bag becomes bland and lifeless. While it remains as an eco-friendly option, it doesn’t include features that would help make it stand out from the pack. The most crucial feature that any reusable bag can have is durability. All too often, we see reusable bags abandoned on trade show floors or in the parking lots of grocery stores because of handles that couldn’t withstand a heavy load. For the brand, a durable bag means consumers will be promoting your message for as long as the bag proves to be useful. We have been adamant about the importance of durability because it correlates to a potentially great return on investment. Made from 85% post-consumer recycled plastic bottles, our bags are built to last while also being completely recyclable. In order to produce a product that can deliver, we administer the Product Acceptance Test to ensure the high quality, durability, and integrity of our various reusable products. Some of the tests include capacity, mass per area, clean-ability and safety. A reusable grocery bag is expected to carry a lot of weight. Make sure that the one you chose is up to the task. For more on how our products did in the testing process, check out the official test results. No product, regardless of its quality, can withstand the test of time without proper upkeep. This is especially relevant when discussing reusable grocery bags. You could be carrying meat, poultry, or fish inside these bags and without proper sanitation, you might be leaving an odor behind, or worse, risking your own health. That’s why reusable grocery bags should be washable. We put together a post full of tips on how to care for and clean your reusable bags. Be sure to check it out. With reusable grocery bags, your brand will gain more exposure with each use and provide value to the customer in their weekly routine. The options for customization are expansive, including a variety of color options to choose from. Decide which message you are hoping to convey, and allow our products to do the rest of the work. 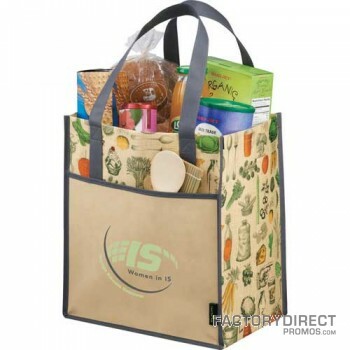 If you would like to get started, check out our variety of options for of reusable grocery bags. As a promotional product, they can carry your brand’s message while providing your customer with an eco-friendly shopping option.